Altogether, legal Super Bowl bettingbrings in more than $6 billion each and every year, and this figure promises to rise rapidly as most states legalize sports wagering going forward. Still, there is often confusion surrounding what constitutes legal or illegal sports betting, but it really is not all that complicated. Misleading sports betting laws have made many fans believe that NFL betting is not possible outside of Nevada, but this could not be further from the truth, especially now that the Professional and Amateur Sports Protection Act (PASPA) has been overturned, with more and more states starting to regulate their own land-based sports wagering industries. That said, for the vast majority of Americans, local betting venues are too few and far between. Fortunately, offshore online sports betting sites make it possible to bet on the Super Bowl without having to take an expensive trip. US-friendly online sportsbooks accept players from all 50 states and provide NFL betting action that rivals – and often exceeds – that of Las Vegas itself. Once you know which legal Super Bowl betting sites to use, you will find plenty of options for betting on the biggest NFL event of the year. Instead of having to scour the Internet for guides on how to bet on the Super Bowl, you can find all the information that you need right here. We will walk you through the legality of Super Bowl betting both on land and online. From there, you can learn more about making deposits at sports betting sites and how to request payouts. It is also important to know other details such as the various NFL wager types and how to read American betting odds. By the time you finish reading, you will have a solid understanding of legal Super Bowl betting and will have no problem placing bets! With the 2018-2019 season just wrapping up in familiar fashion (that is, with another Patriots Super Bowl victory in, somehow, the greatest defensive contest of all time), online sportsbooks and land-based sportsbooks alike are already posting the first futures lines for the next Super Bowl champion. Right now, all the top books in Vegas tend to barely favor the Rams or the Chiefs, which makes sense, given that both teams are potent, fresh, young, and stacked. However, all the online money still seems to favor the Patriots, who are trending atop the futures boards as the most probably Super Bowl LIV winners. Depending on the book you choose, you can get the Pats at +600 to +650, with the rest of the usual suspects from this past season trending right behind them. The 2019-2020 NFL season (which is actually the 100th NFL season overall!) starts September 5, and Super Bowl 54 is slated for February 2, 2020, in Miami, FL, at the Dolphins’ own Hard Rock Stadium. Unfortunately, that’s as close as the Fish are likely to get to the Super Bowl itself, as they’re trending dead last on the SB futures at an embarrassing +30,000. Is It Legal To Bet On The Super Bowl Online In The US? It is 100% legal to wager on the Super Bowl in the US, no matter which state you’re in. There are no federal or state laws that prohibit US residents from placing wagers with offshore sportsbooks over the internet, and even those states that nominally forbid betting of any kind lack both the resources and the infrastructure to prosecute sports bettors. As long as you aren’t operating a sportsbook for profit, you are free to wager on whatever contests you please. Making a deposit at a legal Super Bowl betting site can be completed with just a few easy steps. You will first need to visit the cashier from your account page and select the “deposit” option. There, you’ll find a list of all the deposit options available for your account. One of the best legal sportsbook deposit methods is Bitcoin. The cryptocurrency is as fast as it is reliable, with funds reaching your account within minutes. There are also no fees when you make a Bitcoin deposit (or any other crypto deposit), and you can usually transfer anywhere from $25 to $25,000 for betting on the Super Bowl and other sports. Additional deposit methods for legal Super Bowl betting include Visa, international Visa gift cards, MasterCard, American Express (Bovada and SportsBetting only), MoneyGram, Western Union, cashier’s checks, money orders, and bank wire transfers. Credit cards are a popular method because of their convenience, but you will often find that the maximum deposit amounts do not exceed a few thousand dollars. Bank wire deposits are recommended for high roller sports bettors because there is no limit to the amount you can fund your account with. As you can see, no matter your budget or personal preferences, there is a sportsbook deposit method to fit your needs. The wager types accepted at legal Super Bowl betting sites will remain consistent from book to book. There are two categories of sports betting wagers – straight and exotic. Some of the exotic bets include teasers where the line is moved in your favor by a certain number of points, or parlays where you can combine multiple bets into one ticket for a greater potential payout. Though these bets are used often for legal NFL betting, there are some bet types that are more common for Super Bowl betting. Moneyline – Betting on the moneyline is the most straightforward Super Bowl bet that you can make. 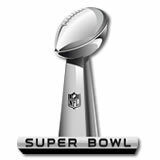 You are placing a bet on whether Team A or Team B will win the Vince Lombardi Trophy. There are no point spreads when betting on the Super Bowl outright. Point Spread – Spread betting is the most common NFL wager type. The oddsmaker will assign a point spread to each team in order to attract action on both sides. The favorite must win the game by more points than indicated in the spread in order to cover and win the bet. So if the New York Giants were favored by 5.5 points, that would be shown as -5.5 on the book’s listing, and the Giants would have to win the Super Bowl by at least 6 points in order for the bet to pay out. The underdogs, on the other hand, must either win the game outright or lose by a lower number of points than those listed. For example, if the Denver Broncos were 5.5-point underdogs, the book would show a +5.5 beside their name, indicating that they could lose by 1, 2, 3, 4, or 5 points and still remain within the spread to win the bet. Totals – Totals betting is also called betting on the over/under. The bookmaker will set a total number of points to be scored by both teams in the Super Bowl. You will wager on whether the game total will go over or under the amount of points listed. As the Super Bowl draws closer, online sportsbookswill offer more NFL prop bets than any other time throughout the year. Betting on the outright winner is popular, but prop bets give you the opportunity to wager on various scenarios that could occur during the game. Super Bowl prop bets will typically fall into one of three categories – team props, player props, and game props. Team Props are those that focus on how a specific team will perform. Some examples of team props would be the over/under on total points scored in the first half by the New England Patriots, whether or not the Seattle Seahawks score in the first 7.5 minutes, whether or not the Atlanta Falcons score the first touchdown, and similar wagers. Player Props are based on the performance of an individual player. You will find that these props are often categorized by position. You can bet on total tackles and assists by a certain player, total passing yards, total touchdown passes, and more. Game Props are quite varied and can be based on just about anything that happens in the game. You might bet on the winner of the coin toss, first touchdown scorer, or what type of score will happen first in the Super Bowl. To request a payout at a legal Super Bowl betting site, visit the cashier from your account page. Once there, you will see several withdrawal options that vary by processing speed, banking limit, and fee amount. Bitcoin is our suggested banking method for the fastest sportsbook payouts. It is a legal sportsbook withdrawal method that is quick and reliable. You can typically withdraw anywhere from $50 to $25,000 and you will not have to worry about any payout fees. There are also other legal payout methods, such as checks, MoneyGram, Western Union, and bank wire transfers. When you use one of these options, you should check with your online sportsbook for any monthly waivers on payout fees. What Does the + and – Mean When Betting On The Super Bowl? Betting on the New England Patriots would require $155 to potentially win $100. Your total return on a winning bet would be $255 ($155 stake + $100 winnings). If you bet on the Seattle Seahawks, you would risk $100 to potentially win $125. The total return on this wager would be $225 including both your original stake and the amount won. Do I Have To Pay Taxes On My Legal Super Bowl Betting Winnings? Yes, you definitely are required to pay taxes on all your legal Super Bowl betting winnings. Remember, even when you’re betting at an offshore sportsbook that operates outside of US jurisdiction, you will eventually be collecting your winnings in the country and using US banks to deposit your funds or convert your winnings to cash. And at that point, the government knows. So instead of risking losing your entire sports betting bankroll, make sure you visit this IRS resource, fill out the requisite forms, and turn them in on time. (If your state collects a separate income tax of its own, you will need to consult with your state’s tax collection laws). Are There Bonuses For Betting On The Super Bowl? All of the top legal Super Bowl betting sites will have sportsbook bonuses for those betting on the big game. One of the most popular offers will come in the form of a match bonus. When you make a deposit into your account, the online cashier will match the amount by a certain percentage. You can instantly receive up to $2,500 in bonuses at some sites. There may also be free bets that you can take advantage of, which take some of the risk out of Super Bowl betting. At BetOnline Sportsbook, for example, you can make a Super Bowl bet of up to $25 from your mobile phone and be credited with a free-play should it lose. Bonuses will vary, so always check the promotional pages at your favorite legal Super Bowl betting sites. Live betting is the most exciting way to wager on the Super Bowl. With in-game betting, the bookmaker will post dynamic odds throughout the course of the game. You have to pay attention to line movements because after each play the odds will be updated to reflect what is happening in the matchup. Some of the betting options might include 2nd half spreads, game totals, 1st quarter moneylines, player props, game props, and halftime totals. Live betting during the Super Bowl adds an extra level of excitement to the championship game, and also increases your wagering opportunities. Is It Legal To Bet On The Super Bowl From My Mobile? Betting on the Super Bowl from your mobile is both legal and convenient. You are able to access all of the same Super Bowl betting lines and odds from the palm of your hand, rather than having to sit in front of your computer screen. The same wager types will be available from your smartphone, meaning you can bet on the moneyline, point spread, over/under, etc. Online sportsbooks for legal USA gambling such as Bovada and BetOnline do not require any download for mobile sports betting. Instead, you can just visit the online sportsbook from your smartphone or tablet to be automatically redirected to the mobile sports betting site. If you have an Apple, Android, or BlackBerry device, you can bet on the Super Bowl from your mobile device.